Screenshot of https://onlinelearningconsortium.org/attend-2017/accelerate/ webpage. 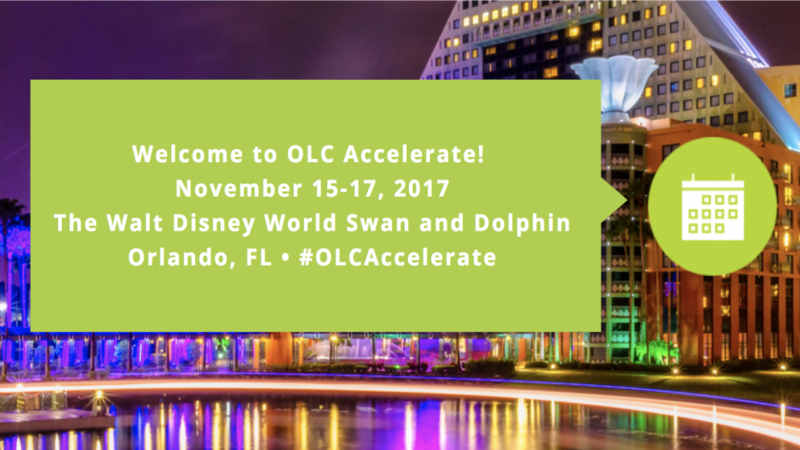 Visit #OLCAccelerate on Twitter to see more highlights from the conference. Bethany Smith and College of Education’s Kerri Brown Parker and Peter Hessling. Photo by Chris Willis. “It was extremely interesting to see how a pilot program to increase online instructors teaching abilities looked from start to finish, and how if you have buy-in/backing from the right people (department heads/administration) requiring online instructors to attend training can actually work, and they see how beneficial and worthwhile the time spent and efforts are (increased completion rates, positive evaluations, etc. ),” said Program Coordinator and Trainer Allie Giro. 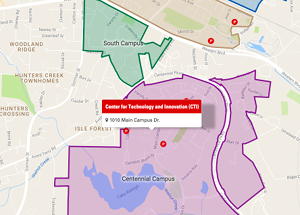 “A community college in Haywood County, North Carolina piloted a program called OTEI: Online Teaching Excellence Institute. In this institute, faculty that are new to teaching online, as well as other faculty that wish to join, participate in a series of workshops and other types of sessions in order to prepare them for the online teaching environment. At the completion of the program, faculty gain certificates and badges. There is also a stipend for those that complete — only $100 right now, but they are hopeful that will increase over the next few years. There are no more than 10 people in this program at a time, and the workshops start at the basic level— teaching the faculty keywords such as synchronous, asynchronous, guide on the side, and sage on the stage — and progress as the program continues. The workshops build on one another and there is a final “project” that the faculty must complete — to create a learning resource for their course (i.e. a video introduction). The thing I liked most about this institute is that the workshops are all pedagogy-focused, and not centered around how to use the LMS,” said Lead Instructional Technologist Suzanne Edmonds. “It was a great informative session. The presenters shared new findings based on the cooperative work between the University of Central Florida and Realizeit, an adaptive learning platform that is gaining rapid visibility. They discussed pros and cons, its complexity and its analytic capabilities. As a few of our grants are focusing on adaptive and personalized learning experience, I think this session was very to the point. The presentation was very interactive, a lot of great questions and answer and in general really worth attending,” said Instructional Designer Jakia Salam. Coordinator for Learning Analytics and Assessment Chris Willis also had the opportunity to attend a pre-conference workshop, Introducing Digital Learning Technologies On Your Campus, which included topics on design thinking, as well as opportunities to discuss with other attendees institutional approaches to digital learning, how to measure course/program success, struggles/concerns, and how to synthesize those insights. Another of Willis’ key sessions was a discovery session titled The Design and Formative Evaluation of Experiential Learning Activities in an Online Masters Course. “I had a great conversation with the presenters about formative evaluation and online collaboration/teamwork that I think will improve my work in DELTA, and I was able to share insights from what we’ve done here to help them as well. 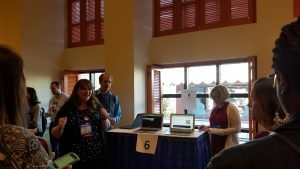 I even connected the presenter with a DELTA instructional designer since they are interested in similar research,” said Willis. Chappelow found the Rethinking The Way We Use Video In Online Learning session helpful for when she consults with faculty. “I learned ideas for content chunking, how to move beyond standard video lectures. Also, ideas for different strategies to create engaging videos were beneficial. I also like how the presenter interacted with attendees and answered questions which I have found helpful for facilitating my future workshops,” said Lead Instructional Technologist Yiling Chappelow. In addition to attending sessions, one of the advantages of such a large conference is to network with those at other institutions. “Networking is one of the huge advantages at any conference, but it was also nice at OLC because I met people in my same field, and we chatted about some of the issues, etc. we see in our universities,” said Edmonds. A DELTA Team member was also selected after the conference for a Social Media Award. Associate Director of Instructional Technology Training Bethany Smith (@bethanyvsmith) received the award for “Most Impressive Notetaking.” Each Sketchnote from sessions she attended were uploaded to Twitter and shared. OLC Accelerate was a great opportunity for DELTA to not only present and share the best practices from NC State, but also for our team to learn from other institutions as well. Associate Director of Online and Distance Education Administrative Services Sharon Broere, Online and Distance Education Scheduling Officer Breanna Collins, Faculty, Student and Program Specialist Allison Harrison and University Program Specialist Tamara Watts represented Online and Distance Education Administrative Services for the first time at the OLC Accelerate conference. Each noted the variety and number of sessions available were unlike other conferences they had attended. “OLC broadens your knowledge and educates you as a participant about different strategies, tools and programs colleges and universities use to get students to engage in online and distance learning, and ways to enhance student learning so they can be successful during and after college,” said Harrison. Networking and learning from other universities were advantages to the conference many DELTA attendees experienced. “You have the opportunity to meet and listen to a wide range of people from very different schools,” said Collins. She noted one instance that stuck out to her was learning about a completely online institution and its commitment to making course material accessible to all students. “Although we are a much larger university with a completely different setup, their outlook on student success was just as applicable to NC State,” Collins added. For Watts, having the opportunity to learn outside of her everyday work environment was important. “Attending a conference like OLC gives you the opportunity to see and explore other ways in which people do things that work really well for them,” she added. One of the benefits of the conference for Broere was speaking with representatives from different companies that provide remote proctoring services. She added it will be beneficial when evaluating services for the future in conjunction with the UNC General Administration. Group Work in Online Courses? Yes! “The facilitator’s intent was to broaden your knowledge on how to create effective communication with online students in online classes through collaboration projects. This involvement required students collaborating throughout the semester with one another. The presenter presented case studies used during the class as part of their demonstration to provide that collaborative projects advance learning during and after college,” said Harrison. “The session focused on making course material more accessible to all students, not just students registered with the Disability Services Office (DSO). With this, it will reach students not registered with DSO, who may not recognize they need the assistance, or who may need another means to learn the material. The speaker told a short story where a group of kids were waiting outside of school on a snowy day and one was in a wheelchair. They could not get into the school because of the snow and were waiting for the maintenance member to shovel the steps. The student in the wheelchair asked if they could shovel the ramp so they can get in but the response was the ramp would be shoveled after the steps as more kids were waiting for the steps. The speaker continued and drove home the point that had the ramp been shoveled, every student would have been able to get inside. I thought this was a great and applicable perspective on accessibility,” said Collins. Watts and Broere both noted the keynote speakers were engaging and enjoyable. “Luhn shared an amazing story on his journey and becoming a part of Pixar,” said Watts. Other key takeaways from Watts and Broere included a session on animation and quiz tools with Adobe Spark. Also, Broere learned about a tool with Canvas that would work well with NC State faculty who have students with DSO accommodations. Article compiled from DELTA attendees Bethany Smith, Allie Giro, Suzanne Edmonds, Chris Willis, Yiling Chappelow, Allison Harrison, Breanna Collins, Tamara Watts and Sharon Broere. 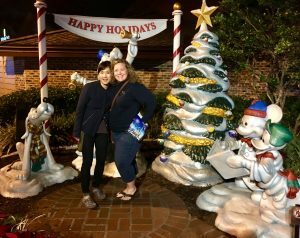 While in Orlando, Suzanne Edmonds and Yiling Chappelow visited Disney Springs. 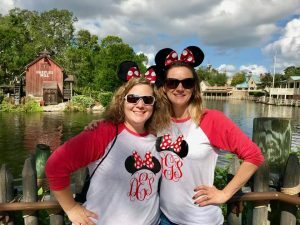 Suzanne Edmonds and Allie Giro at Disney World’s Magic Kingdom.